Greetings from the flower alphabet think tank! This week, I thought to feature a quirky little bloom that is primarily used as an accompaniment in arrangements. 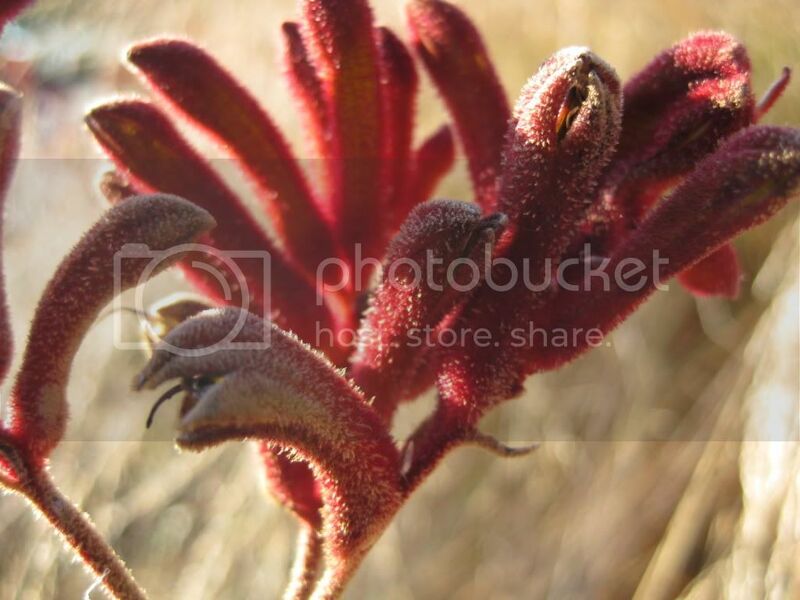 “K” is for kangaroo paw! You can see the fuzzy paw-like flower above, nestled in among other friendly blooms. A native of Australia, the kangaroo paw got its name in the most literal way — it has a downy feel (like fur!) and is shaped like the paws of that beloved marsupial. Kangaroo paw are relatively easy to grow — they like full sun and good drainage — and are often found in xeriscape gardens in southern California and similar climes. Despite their exotic provenance, many flower shops and plant stores carry these flowers. In the image above, you can see the ends of each bud open up to reveal the tiny “fingers” of the paw. Kangaroo paw come in a range of earth tones — green, red, orange, yellow and brown — and often have subtle “painted” two-tone colors. This variety is a beautiful gray shade with a hint of rose pink on the stem and base. For the arrangement that follows, I selected flowers inspired by the peachy pink secondary tone. CLICK HERE for the rest of the post (and more pictures) after the jump! I started with a pedestal vase that has a bulbous shape but a relatively small opening. This makes designing much easier, as the smaller opening will hold the stems tight and assist with the structure. I added some wild greens — fragrant rosemary and delicate fern — to create a foundation for the blooms. I have layered the greens here to cover the opening of the vase completely. When we start to add individual flower stems, this tight framework should hold the blooms in place. Experiment with the right amount of greens for whatever vase you select, and don’t be afraid to pull them out and start again if things aren’t filling in properly. I added five coral peonies. I envisioned this arrangement as a bit loose and romantic, so as I built with each flower, I used only a few blooms initially and allowed them to jut out and drape naturally. As you continue with each successive flower, you can always fill in open spaces. These rich, pink peonies are called “K”ansas peonies — I just thought I would mention that :) Notice how the bloom above stands up proud and tall in the nest of greens. You can place the blooms just exactly where you want them if the greens are working for you. Now tulips and ranunculus enter the scene. I typically start adding in odd numbers — threes or fives. I have selected big-headed “face” flowers to fill up this arrangement, so when we finally add the spindly kangaroo paw, it will be optimally visible. Above, another close look at the nest of greens. Look, even the lazy tulips are fastened tight in there! After filling in with the robust blooms, I added the kangaroo paw. I decided to use it two ways: sitting low and tight among the other blooms and making a statement up high with a tall flourish. The stem of the kangaroo paw is very clean, straight and tough, so adding it to the arrangement is easy; it fits right in between the other flowers. I also added more greens here and there for texture. I can see this working as a centerpiece for an Australian garden wedding. Any and all Australian readers who feel they must bring me down to do their wedding flowers should know that I would seriously consider it :) Although, you will obviously have to wait until I finish up with Wills and Kate at the end of April (wink, wink). See you back here in two weeks when “l” will be for . . . I am so in love with these posts. Gorgeous bouquets and beautiful photos. What a great way to start my day…such luscious pictures of a beautiful arrangement. This is a great idea for any flower that needs some help to shine, or looks a bit spindly on it’s own. I can picture freesias as an alternative to the kangaroo paw. how very adorable! i’m going to look for this around nyc. i love how the step-by-step pics of how you created the arrangements, thank u.
the things you learn on the internet! I’m a kangaroo paw fan now. We have loads of orange and dark red kangaroo paw plants in our Bay Area garden – never thought to clip a few and bring them inside. Thanks for the gorgeous inspiration. such gorgeous.. gorgeous images!! Love the reds… :-) Have a lovely weekend! As an Australian I’m thrilled that you’ve used a Kangaroo Paw for letter K. Unfortunately I think you’ve pick the most dull example of the flower I’ve seen. If they were in my garden I would dead head them. Try the traditional red and green and then you wouldn’t need any other feature flowers. Another Australian delighted to see these here & puzzled why the grey one were chosen – there is a white one, is this the same perhaps, and many hot pinks & the classic West Australian red & green. I think, from when I did flowers for work in the US, that you tend to do (gross generalization) far thicker/heavier flower arrangements than us – I agree that kangaroo paw on its own is perfect. Seems crazy to see you feature these, and to call them ‘exotic’. I’ve got hundreds growing wild in my back paddock! Hello from the south-west of Western Australia! Gorgeous! I love peonies. I wish I could grow them where I live. I love kangaroo paw. The first time I was introduced to it was through my wedding florist. She put really deep fall colored kangaroo paw in my bouquet. Just beautiful! I’ve loved it’s quirky shape and beautiful color ever since. That arrangement would be lovely for an Australian bouquet… if you can get the peonies! Good luck with that! They are so, so, so rare (at least in WA, where the k-paw is native and the State flower) – they have to be flown in from Tasmania – and the colour range is extremely limited. I agree…with Alex above. I have to find that dusty grey paw! So lovely…I have many in my garden here in Melbourne but its now empty without these. If you love the grey kangaroo paw you’d adore flannel flowers – soft and furry just like flannel and a wonderful soft grey white colour. So exciting to see Australian flowers featured! If you want bright go with grevillias – 1000s of varieties with gorgeous warm coloured spikey flowers and very hardy in pots or the garden. Birds love them. It was taken near the Three Sisters lookout in the Blue Mountains. Where to get this vase??? I love it!